We demonstrate the operating principles of single mechanical seals, double mechanical seals and gland packing. Then we discuss the advantages and disadvantages of each option. Animated diagrams, CGI and physically cross-sectioned mechanical seals are all used to show how each sealing option functions. Many applications can save a typical 6 million litres of water per pump, per year of clean water. The training video looks at some of the major challenges in reliably sealing applications without huge, unnecessary water waste, including pressure fluctuations and effective heat removal. 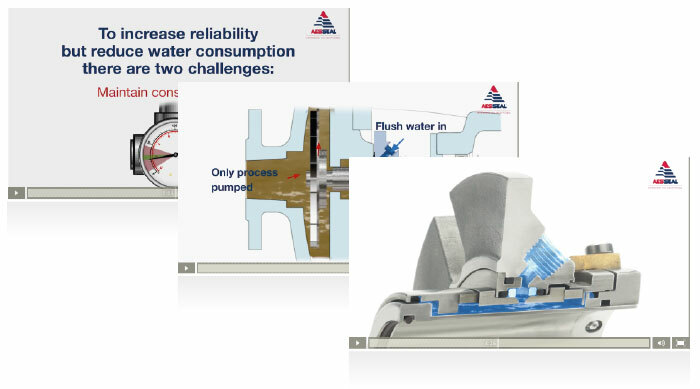 We explain the issues and best practices; including an approach to improve reliability and eliminate water-use by overcoming these challenges.